Ni-Cad Battery Replacement for MJR Series. Application: When your Amano MJR clock resets itself, or is losing A-LOT of time (not miscalcuating, they never miscalculate). The first thing you try is to replace this battery. There is a lithium-ion battery soldered to the circuit board. After a decade or so, it dies. 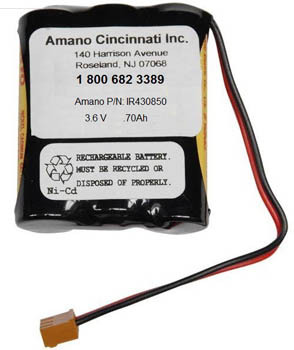 The Amano ni-cad battery pack provides back-up power to the onboarad battery when power goes low or off, maintaining the program you see, and the core program behind that. You cannot replace the Lithium Ion battery, as it is soldered to the motherboard. The battery pack is inside the right side of the frame, held in place with a white nylon zip tie. 1) LEAVE THE CLOCK PLUGGED IN. Unplug it and you risk losing everything. We have nevere gotten shocked doing this, this way. 2) Unplug the old battery pack connector, plug the new one in. opposite where the old, now dead, battery is. We remove the old one, then slide the new one back inside the machine, then make the connection. But there are sensitive wires in there, the difference is only cosmetic. We also clean the sensors and check (typically update) the daylight savings program, correct the time, check the program - we call you - and oil the machine, get rid of that grinding noise you are hearing, and replace the ribbon. We can replace the printer if it is printing poorly - the ribbon cable cracks over time, which is why it might print clearly on the left, and worse as it goes to the right side of the time card. The MJR keypad can also corrode, we have new ones. This is done when the keyboard does not respond. These machines are designed with a 30+ year life span, and only minimal maintenance is needed. We can replace the sensors. Optical sensors wear out. Repairs are usually much less costly than replacing the machine. You can also make this machine ring bells, and set up broad IN-PUNCH rounding zones, like no one gets paid until the start time of 7AM, even if they punch in at 6:30 when they first arrive. Stops people from getting paid extra money for unworked hours.